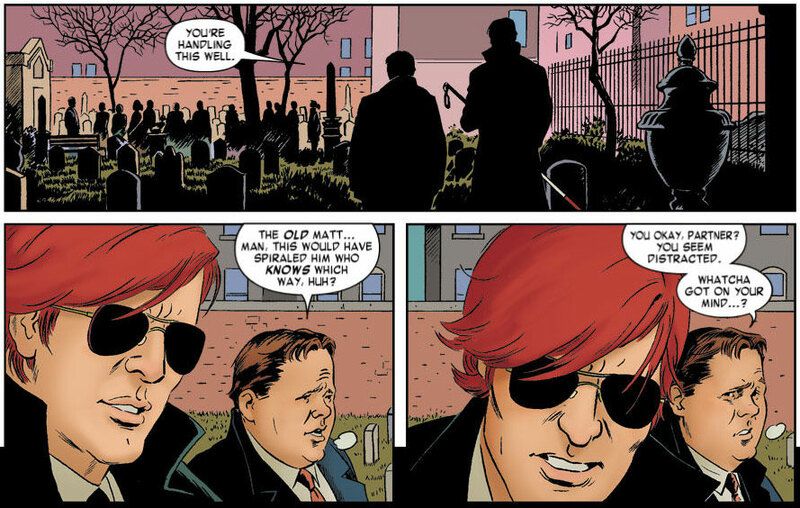 Daredevil #10 is another great issue by Mark Waid, Paolo Rivera and the rest of the team. The pacing on this book continues to be pitch perfect and and every single issue amazes me by offering so much story progression – on several fronts – without sacrificing any of the depth. While you know that each issue is going to be great, that tends to be the only thing you know. Sure, we all knew Daredevil was going to escape almost being swallowed whole (and not just from checking out the previews), but nothing else in this issue happens the way you expect. While Daredevil and Mole Man come to blows in a wonderfully choreographed duel that sees the seemingly ungraceful subterranean bounce around like an over-sized Yoda, they also seem to switch roles in a surprising yet revealing manner. We come into this issue already guessing that Mole Man must be a mad man to steal a bunch of coffins just to get his hands on the corpse of a long lost love. While we don’t walk away from this story ready to give him a clean bill of mental health, Mole Man is not as delusional as one would have guessed. There is no magic potion or other outlandish plan to bring her back and as the issue progresses, it is Daredevil who is shown as the one who has the biggest problem letting go of the past. With this issue, one of the many wounds of Matt’s past is torn open and the lack of complete closure from his encounter with Mole Man, as well as the pressure he is under with the Omega Drive in his possession (we get to see in this issue just what the Black Cat decided to do with it) combine to make him sufficiently on edge to cause Foggy to start worrying. The façade has indeed started to crack, but Waid doesn’t go overboard with this development which feels completely organic and in line with how Daredevil has been written up to this point. This is, on the whole, an issue which feels sad, morbid and whimsical at the same time. Those are not the kinds of adjectives you usually find anywhere near each other, but the story covers all of these bases and more. I could not be happier with this book right now. It’s exciting, beautiful and combines the exotic superhero elements with the human drama in a way that makes the reader deeply invested in the story and all characters involved. I cant wait to pick up this issue!!! I thought that this was another note-perfect installment from the dream team of Waid and Rivera (who is fast becoming my favourite artist – when you look at how much he’s developed his craft since, say, the Spidey/Punisher team up issue in Amazing Spider-Man a couple of years back, it’s actually quite staggering). 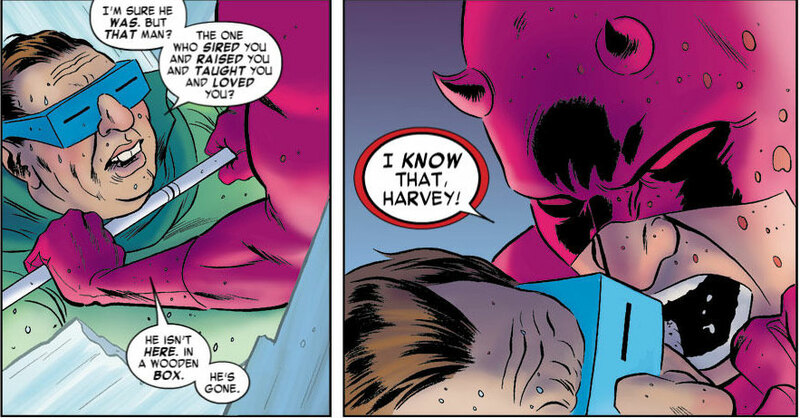 Having said that, there was one part of the issue which threw me a little: The part early on where Mole Man asks; can’t Daredevil see how ugly he is? Matt replies that no, he can’t. Yet we’re shown a panel of DD’s radar mapping the contours of Mole Man’s face, showing us that actually DD could “see” how ugly Mole Man was. Great Issue. Can’t say enough about what Waid and team are accomplishing with this book. I’m one of these cynics who thinks Mole Man is one of the lamest super villains ever, but Waid made it work. I really hope Black Cat shows back up down the road. She and Matt had great chemistry together. @Daniel: I finally got around to analyzing your comment! Read here.